DESCRIPTION: I was tasked with creating a New Year or Year in Review layout so I went with New Year and tried to set some realistic goals. Stars remind me a lot of New Year for some reason (anybody else share this belief?! :) so I made a bunch of 'em. JOURNALING SAYS: 1. eat healthier & exercise. 2. daily dog walks. 3. read more. 4. scrap more for me. 5. be present. 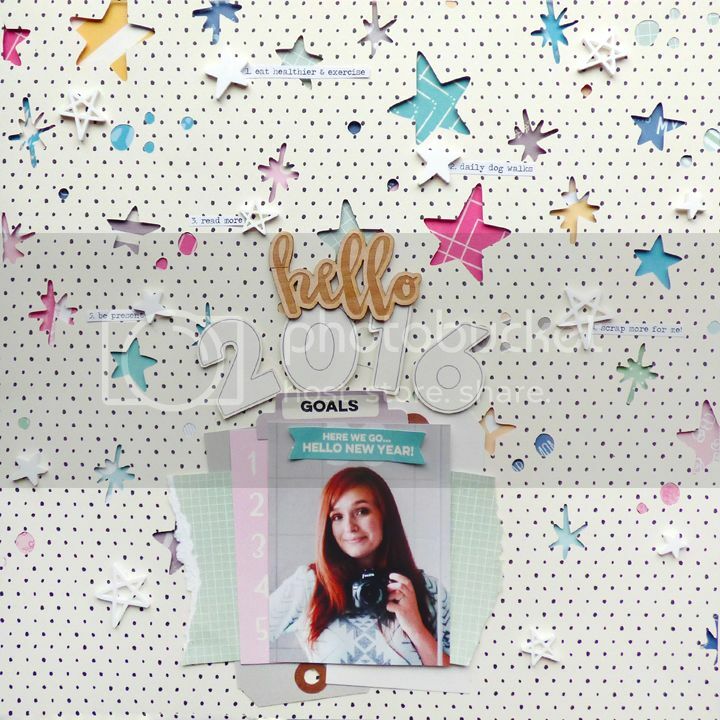 HOW TO: Turn the stars card from the December printables into a cut file, enlarge it to cover an entire 12x12 page, then cut the stars from a paper in the Thankful collection. 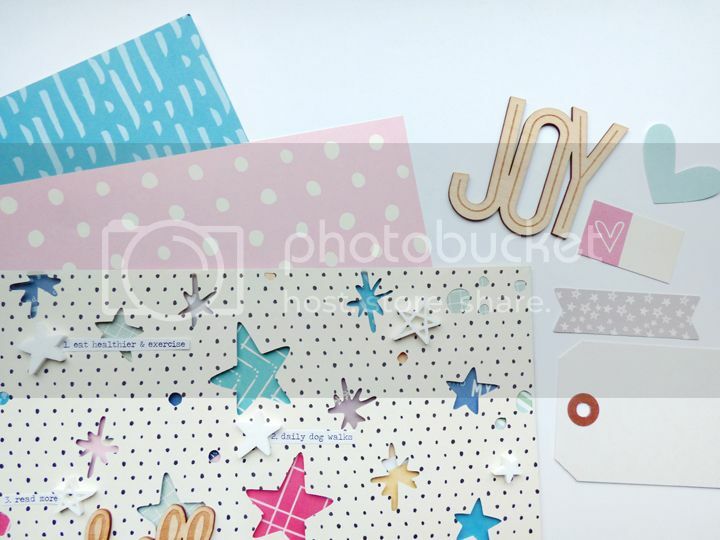 Back the stars with dimensional adhesive and patterned papers, die cuts, and the cards used in product packaging. Use glue dots to attach all of the white acrylic stars over the page. 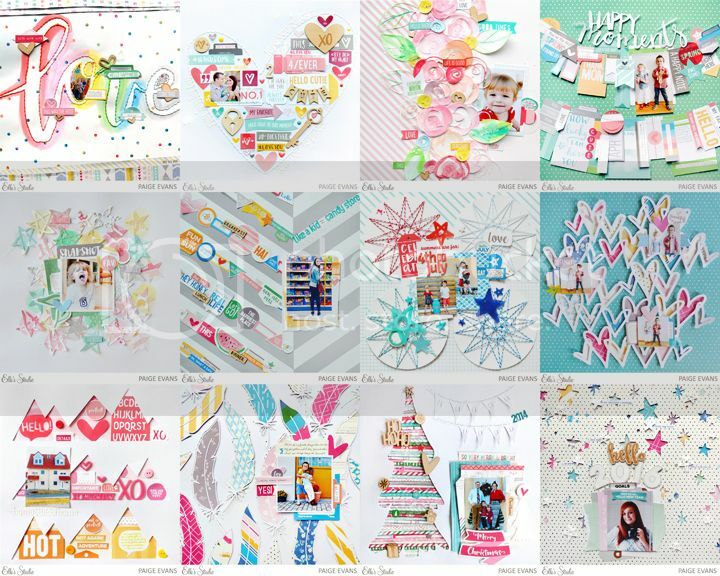 Layer tags, cards, die cuts, and a photo across the bottom and add a die cut banner at the top. Stamp "GOALS" on a tab and tuck it under the top edge of the photo. Cut out the "2016" from a card and adhere in a slight curve with pop dots. Place a "hello" wood veneer piece above the numbers to finish the title. Print goals in a typewriter font (I used Traveling Typewriter) and adhere them across the top of the layout. Thank you for the fun year Elle!! Saw this over at Elle's and just LOVE it!!! LOVING that photo of you! Cute!!!!! !